Centris species collect floral oil and use this resource in larval food and for waterproofing their cells. We investigated the trophic niche of three distinct populations of Centris burgdorfi, a widely distributed bee in Brazil, by using pollen collected from female bees. Our goal was to determine whether there is versatility regarding sources of oil, nectar, and pollen in different regions of Brazil. By using the pollen, we also determined whether the source of oil used corresponded to the collection apparatus of the females. In total, we sampled 150 C. burgdorfi females and their associated pollen in three distinct habitat types across Brazil. We prepared pollen by acetolysis and performed quantitative analysis on 400 grains per bee. We identified 41 plant species belonging to 18 families that were used by C. burgdorfi. Although none of the plant species used by C. burgdorfi were shared among areas, the Chamaecrista genus was present in the diet at all three sites. The probable oil source came from plants of the genus Krameria, a genus with epithelial elaiophores. In regions where the Krameriaceae family was not present (e.g., southern Brazil), bees used Angelonia integerrima, a plant with trichomate elaiophores, demonstrating that C. burgdorfis exhibited versatility in its dietary breadth among the studied regions. C. burgdorfi proved to be locally specialized in oil floral source and selectivity in pollen sources, but a generalist when evaluated the wide geographic distribution. Handling Editor: Isabel Alves dos Santos. Bees species with a more restricted diet usually have a limited distribution, based on the distribution of the plants upon which they feed (Michener 1979). Therefore, species that exhibit some versatility in their dietary behavior may be able to live in locations with different plant groups. There are several types of specialization in the collection of floral resources among bees. The use of a single species of plant for pollen collection (i.e., monolecty) is extremely rare among bees (Cane and Sipes 2006; Minckley and Roulston 2006). Despite a broad spectrum of available pollen sources, several species of bees restrict their larval diet to only a few plant species of the same genus or family. This phenomenon is known as oligolecty, and occurs in a vast number of species (Schlindwein 1998, 2004a). At the other extreme, the polylectic species collect pollen from many plant species from different lineages (Cane and Sipes 2006; Minckley and Roulston 2006). Among the many polylectic species are the eusocial species (Ramalho et al. 1990; Aleixo et al. 2013) and the majority of bees of the genus Centris (Schlindwein 2000, 2004b; Silva et al. 2017). Avoiding inter-specific competition is pointed as one of the mechanisms behind the use of multiple resources observed in various species in nature (Kneitel and Chase 2004). Also, it could be postulated that broad generalization should lead to high local abundance (as well as broad geographic distributions) because generalists are able to exploit a broad range of resources, thus giving them an advantage over specialists (Brown 1984). In addition to pollen, Centris females collect floral oil and use this resource to waterproof their brood cells (Vogel 1990). Furthermore, floral oil provides more than twice the energy of nectar (Buchmann 1987) and presumably less prone to spoilage than nectar (Wcislo and Cane 1996), which makes many species opt for this resource to feed their larvae. The production of floral oil is present in 11 families of plants that occur mainly in tropical and subtropical regions (Renner and Schaefer 2010). Floral oil is produced in secretory glands called elaiophores, which may be in the form of epithelium, as in Malpighiaceae and Krameriaceae, or trichomes, as in Calceolariaceae, Cucurbitaceae, Iridaceae, Myrsinaceae, Plantaginaceae, Scrophulariaceae, Solanaceae, and Stilbaceae (Vogel 1974; Buchmann 1987; Alves dos Santos et al. 2007). Some species of bees have developed specialized morphology or behavior to collect floral resources that are difficult to access or extremely specific (Schlindwein 2000). To collect, handle, and transport floral lipids, Centris bees have elaborate setal combs and pads found on the fore- and midlegs (Roberts and Vallespir 1978; Neff and Simpson 1981; Roig-Alsina 2000; Alves-dos-Santos et al. 2007). When the female has large, well-developed setae with triangular and spatulate apexes in the basitarsus of the fore and mid-legs, it is denoted as the “four-legged pattern” (Vogel 1974). The morphology and position of the setal combs and pads are correlated mainly with the types of floral elaiophores (Neff and Simpson 1981). Well-developed combs (as seen in the most species of Centris and all species of Epicharis) are often associated with epithelial elaiophores (where the female should break the cuticle covering the epidermal secretory cells). The reduction of this patter, characterized by giant seta with a slightly rounded apex [as seen in Centris (Paracentris) subgenus], is associated with trichome elaiophores (patches of secretory hairs, where the oil is much more accessible) (Neff and Simpson 1981; Simpson et al. 1990). Herein, we investigated the trophic niche of three distinct populations of Centris (Paracentris) burgdorfi, that occur in different biomes in Brazil, using pollen taken from the females’ bodies. We explored the interaction network structure between bees and plants in each location. We aimed to know how the wide distribution of the species in Brazil is linked to the fidelity in the use of floral resources. We asked three questions: (1) Which plant species are used to feed the adult and immature? (2) Is there fidelity in the use of some plant genera? (3) What species of floral oil-producing plants with what type of elaiophore did the females use? Based on the wide distribution of the C. burgdorfi in Brazil, we hypothesized that there would be versatility in the use of floral resources. We performed the study at three locations in Brazil: Natal in northeastern, Cavalcante in central-western, and Ponta Grossa in southern Brazil. Each region was at least 1400 km from the others. In Natal, in the state of Rio Grande do Norte, we obtained pollen samples in the dunes known as the “Deserto dos Anjos” where C. burgdorfi nest (05°36′S, 35°14′W; elevation: 41 m asl; Fig. 1a). The coastal dunes are located in a transition zone between the climate type As’, hot and humid because of high rainfall, and Bsh, hot semi-arid because of strong evaporation (Köppen classification see in Alvares et al. 2013). The average temperature is about 26 °C and the rainy season is from March to August, with an average annual rainfall of 1900–2200 mm (Alvares et al. 2013). We collected samples from 20 to 23 April 2011 (n = 15) and from 10 to 22 April 2014 and from 1 to 13 May 2014 (n = 35). In Cavalcante, in the state of Goiás, the sampling place was inside the protected area called “Chapada dos Veadeiros” (GO) (13°37′35.6″S, 47°29′08.0″W; elevation 853 m asl; Fig. 1b). The climate is Aw, with an average annual temperature between 19 and 22 °C, and average annual rainfall between 2400 and 2800 mm (Alvares et al. 2013). The region is part of the Cerrado and has plants typical of fields associated with rock formations at this altitude. We collected the samples from 14 to 28 April 2015 (n = 22), and from 19 to 22 April 2017 (n = 28) during the rainy season. In Ponta Grossa, in the state of Paraná, we collected the samples within the “Parque Estadual de Vila Velha” (PR) (25°13.839′S, 49°59.561′W; elevation 1017 m asl; Fig. 1c). The climate is the Cfb type, with an average temperature in the coldest month between 18 and 20 °C, with cool summers, and an average annual rainfall of 1300–1600 mm (Alvares et al. 2013). The area has a combination of landscapes, including high-altitudinal fields dominated by Asteraceae, Araucaria forest, and rupicolous vegetation associated with sandstone (Gonçalves and Melo 2005). We collected samples in the warmer periods from 8 to 19 December 2014 (n = 18) and from 21 to 25 November 2016 (n = 32). We used an entomological net to collect C. burgdorfi females during flight activity in the three study sites. In total, we collected 50 females in the costal dunes (RN), 50 females in the Cerrado (GO), and 50 females in the high-altitudinal field (PR). The pollen was removed by washing the female using a Falcon tube with 2 mL of water (Fig. 2a, b). After removal of pollen, we check bees after washing to see if all pollen was removed and passed the bee through a drying process with absorbent paper, and we marked the thorax with non-toxic paint (Posca®, Tokyo, Japan) before release (to avoid collection of the same specimen). Then, we preserved the remaining material in the Falcon tube with 6 mL absolute alcohol for at least 24 h.
In the first year, we were able to identify the key plants that the females are using through the preliminary pollen analysis. With this information, in the second year we made a more precise observation in the field to see the behavior of the female collecting the resource. This, added the fact that we knew what resource the plant produces (using literature data), allowed us to discuss about the possible resources that the females are collecting in these key species (nectar, pollen, or oil). We centrifuged pollen material at 2000 rpm for 10 min, discarded ethanol, added 4 mL of glacial acetic acid, and allowed the samples to stand for 24 h. Subsequently, we acetolyzed the pollen grains (Erdtman 1960), embedded them in Kisser gelatin, and sealed the slides with transparent varnish. We identified pollen grains to the lowest taxonomic level possible, and documented the frequency of occurrence of each taxa per slide. For more accurate identification of the pollen taken from the bee samples, we also made references slides of the flowering species in each sampling area by collecting the anthers and subjecting them to acetolysis following Silva et al. (2014, 2016). We also used the pollen collection present in the RCPol—Online Pollen Catalogs Network (http://rcpol.org.br/en/homepage/) to identify the plant species or pollen type through comparison with reference material. To evaluate the plant species used, we conducted a qualitative analysis by identifying the plant species in the samples. Afterwards, we conducted quantitative analysis of the importance of each plant species used by the bees. Thus, we examined the first 400 pollen grains in each sample, as suggested by Montero and Tormo (1990). Then, we calculated the percentage of each pollen type in a sample and classified the pollen grains per Maurizio and Louveaux (1965): dominant pollen (> 45% of all grains counted in each sample), accessory pollen (15–45%), important isolated pollen (3–15%), and occasional isolated pollen (< 3%). To evaluate the importance of each plant species according the volume of the pollen grains, we calculated the estimated volume for each pollen type by using the pollen grain measurements in the volumetric formulae [Ellipsoid = 4(πe2p)/3 and sphere = 4(πe3)/3]. The data were collected using 15 grains (randomly encountered on the slides) of each species in equatorial view, where we obtained the mean value of the polar radius (p) and equatorial radius (e) (following Buchmann and O’rourke 1991). Pollen types with few grains on the slides were insufficient to be measured and their volumes were not calculated. From the proportion data, we evaluated the trophic niche using the index of Shannon (1948) (H′). A Hutchinson t test was performed to determine if there were significant differences between the values of the Shannon diversity indices between the three areas. To examine the uniformity of the samples, we used the index of Pielou (1966) (J′), and to analyze dominance we applied the index of Berger–Parker (Magurran 2004) (D). Analyses of diet breadth were performed using the statistical software PAST 2.17c (Hammer et al. 2001). 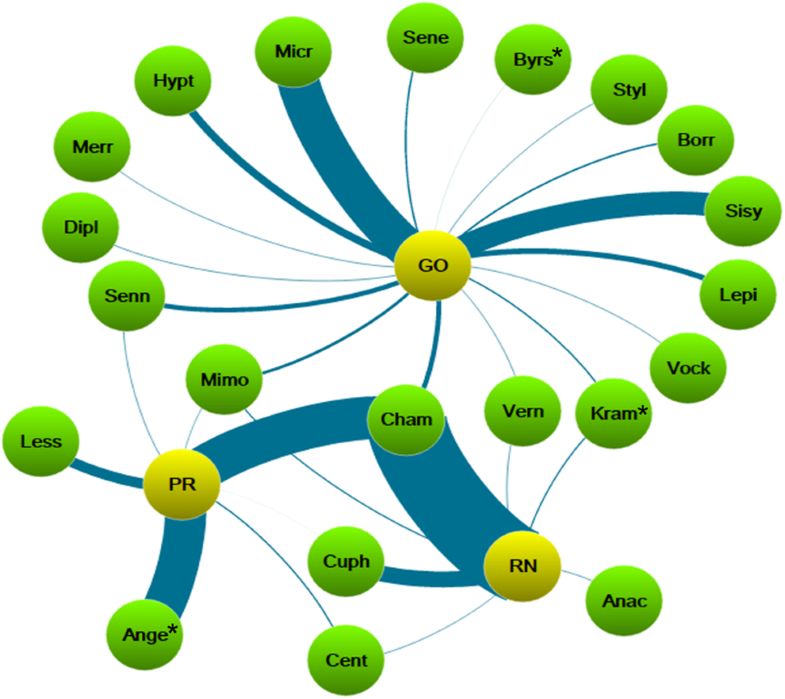 We represented the trophic interaction network as bipartite graphs (Dormann et al. 2008) using the bipartite package for R (R Development Core Team 2012). We draw weighted graphs in Pajek 4.10 (Batagelj and Mrvar 1998) using the “Kamada-Kawai free” method, which enhanced the subgroups and the centrality of each vertex. We identified 41 plant species belonging to 21 genera and 18 families in the diet of C. burgdorfi (Table 1) in the three localities. In Natal, we identified eight plant species and Chamaecrista (Leguminosae-Caesalpinioideae) was possibly the main source of pollen, with a high frequency of occurrence on the slides (Chamaecrista hispidula (Vahl.) Irwin & Barneby = 42.61% and Chamaecrista flexuosa (L.) Greene = 37.34%, together accounting for almost 80% of the pollen grains in the samples). Cuphea flava Spreng. (Lythraceae) was possibly the major source of nectar, constituting 17.05% of the samples. The source of floral oil in the samples was exclusively Krameria tomentosa A. St.-Hil. (Krameriaceae). The number of pollen grains of this plant in the samples was low (1.45%), but consistent among slides (94.74%). Lepidaploa rufogrisea (A.St.-Hil.) H. Rob. Lessingianthus grandiflorus (Less.) H. Rob. In Cavalcante, we identified 19 species belonging to 16 genera and 15 families. The main source of pollen in the samples was possibly Microlicia cryptandra Naudin (Melastomataceae) (32.39% of all pollen grains). Krameria grandiflora A. St.-Hil. was the main source of floral oil, with its presence consistent among slides (91%). The major source of nectar possibly came from Lepidaploa rufogrisea (A. St.-Hil.) H. Rob. (Asteraceae) (3.05%) and a Bromeliaceae that was not identified (15.08%). In Ponta Grossa, we identified 14 plant species belonging to six genera and seven families. The main source of pollen in the samples were possibly Chamaecrista sp.1 (45.95%) and Angelonia integerrima Spreng. (Plantaginaceae) (40.37%). The latter species was the source of floral oil, and we verified that the females actively searched for oil with our observations in the field. Pollen was probably passively attached to their body. Lessingianthus grandiflorus (Less.) H. Rob (Asteraceae) (11.17% of all pollen grains) was possibly the main source of nectar. Diversity indexes in Cavalcante were the highest (19 pollen types). The Shannon Index (H’ = 1.71) was greater than that of Natal (H’ = 1.17) and Ponta Grossa (H’ = 1.09). Evenness was lower in Ponta Grossa (J = 0.41) than that in Cavalcante and Natal (JCavalcante = 0.58 and JNatal = 0.56). The dominance index was similar among the three sites (DCavalcante = 0.49; DNatal = 0.43; DPonta Grossa = 0.46) (Table 1). Hutchinson t test revealed that the index of diversity differed significantly between all areas (p < 0.05). The genera Chamaecrista and Mimosa were the only pollen sources shared by the bees from the three sites (Fig. 3). We identified at least five species of Chamaecrista (Table 1) and in the localities of Natal (two species together) and Ponta Grossa they were the dominant pollen grains. Mimosa, on the other hand, appears only as contaminant pollen (< 3% and not consistent among the slides) in all three sites. In the bipartite networks constructed with the proportional number of pollen types found in each sample and at each locality, it was possible to observe the dominance of Chamaecrista in Natal and Ponta Grossa (Figs. 4, 6). Chamaecrista hispidula and C. flexuosa were the main pollen grains, dominant in 44 out of 50 samples (22 each) collected in Natal (Fig. 4). In Ponta Grossa, the dominance of Chamaecrista sp.1 was shared with Angelonia integerrima (28 and 18 samples, respectively) and both were accessory pollens in others (10 or 19 samples, respectively) (Fig. 6). In Cavalcante, it was clear that more species occurred in the diet of C. burgdorfi. Microlicia cryptandra was dominant in 23 out of the 50 samples, and was an accessory in the other 10. One species of Bromeliaceae (which could be also source of nectar) and Sisyrinchium vaginatum Spreng were dominant pollen grains in eight samples each (Fig. 5). The mean pollen grain volumes reinforced the importance of Chamaecrista in the samples in Natal and Ponta Grossa, and also Bromeliaceae in Cavalcante. The smallest pollen grains were from Angelonia and Microlicia, which resulted in these species being at smaller proportions in each sample (Table 1). The grain volumes carried by females ranged from 0.51 to 22.45 × 10−8 cm3 in Natal, 0.2 to 24.82 × 10−8 cm3 in Cavalcante and 0.06 to 7.66 × 10−8 cm3 in Ponta Grossa. Centris burgdorfi proved to be locally specialized in oil source showing fidelity to one oil plant species, but a generalist when evaluated the wide geographic distribution. Overall, we did not observe any plant species, and only a few genera, shared among the areas, which was expected given the difference (mainly in relation to the type of vegetation) among the study areas. 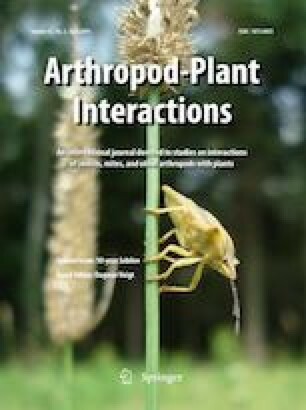 Although we do not systematically quantify the visits in the plants, the pollen analysis, associated with field observations, can help us to infer relationships between the C. burgdorfi and the plants in each study site. It was clear that plants of the genus Chamaecrista were one of the preferred dietary sources for C. burgdorfi. Pollen of this genus was common in the samples at the three locations, even with the differences among the study areas. Chamaecrista flowers are important pollen sources for bees of the genus Centris (Aguiar 2003), which are able to collect pollen through vibration of the anthers (Buchmann 1985). Therefore, this genus is commonly found in the results of studies regarding the trophic niche of Centris (e.g., Gaglianone 2001; Dórea et al. 2009, 2010a, b; Santos et al. 2013). Nutritionally, plants with poricidal anthers tend to have very protein-rich pollen (Rolston et al. 2000), which could be an important resource for the bees in both their larval and adult diets. The highest diversity of plants used by C. burgdorfi females was in the Cerrado (Cavalcante). This phytophysiognomy was certainly richer compared with that of dunes and high-altitudinal fields. The largest, richest, and possibly most threatened tropical savanna in the world is the Cerrado; a large region that occupies the center of South America (Silva and Bates 2002). The greater evenness observed in Cavalcante indicated that females were using the plants species uniformly, without the dominance of any single species in the network. Conversely, in the costal dunes (Natal), we observed lower richness compared with that of the two others. The dune habitat was characterized by sparse plant cover (Calliari and Klein 1993) and this was reflected in the restricted number of plants available for the visitation of bees. The presence of pollen grain species of Krameria in Natal and Cavalcante samples add to our observation of females visiting the plant in the field is a good indicative that demonstrated that they used plants of this genus as a source for floral oil at these sites. Although Centris bees are commonly known as generalists in terms of sources of floral oil (Buchmann 1987), the analysis showed a high fidelity to one species. In both locations, there were species of Byrsonima (Malpighiaceae, an oil plant with strong relation with Centris bees) flowering at the same time, but Byrsonima only appeared as occasional isolated pollen (< 3%) in Cavalcante and none occurred in Natal. The genus Krameria has a distribution generally associated with arid and semi-arid locations in the Americas (Simpson 1982) and occurs only in parts of southeastern and none of southern Brazil. In the absence of Krameria in Ponta Grossa, C. burgdorfi used Angelonia integerrima as the floral oil source. Females of the Centris (Paracentris) subgenus exhibit pronounced changes in the common pattern of most four-legged Centris. The modification of this pattern (called “four-legged with modifications”) was observed in 15% of Centris species, and is characterized by giant seta with a slightly rounded apex, as seen in C. burgdorfi (Taniguchi 2010). These modifications are often related to the collection of floral oil in plants with trichomatic elaiophores, which are easier to access than those that are epithelial (Vogel 1974; Simpson et al. 1990; Cocucci 1991). In other words, plants possessing the trichomatic pattern would be preferably used as a source of oil. In fact, there is an association between C. burgdorfi and Angelonia (a genus that possess trichomatic elaiophores). Martins et al. (2013) also recorded this bee species collecting floral oil from Angelonia eriostachys Benth. and Angelonia goyazensis Benth. in a high-altitudinal field in southeastern Brazil. Despite the association with Angelonia, the use of Krameria as a source of floral oil in Natal and Cavalcante demonstrated that the oil-collector apparatus (it means, the basitibial scraper setae on the forelegs) does not restrict this species of bee to one or a few types of elaiophores, as previously proposed by Simpson et al. (1990). Carneiro et al. (2015) observed Centris hyptidis, previously associated with trichomatic elaiophores, collecting floral oil from K. tomentosa in areas with no Angelonia. Centris (Heterocentris) analis is known for collecting floral oil from both Malpighiaceae (Oliveira and Schlindwein 2009) and Plantaginaceae (Martins et al. 2013). As in the recent debates on floral syndromes and pollinators (see the review of Rosas-Guerrero et al. 2014), the restricted connection between the oil-collector apparatuses in bees and the type of elaiophore used should be applied with caution. We never saw any Byrsonima visits, by the C. burgdorfi females, in the three study sites. The association between Centris bees and plants of the family Malpighiaceae is widely known (Vogel 1990; Sigrist and Sazima 2004; Bezerra et al. 2009; Mello et al. 2013; Oliveira et al. 2013; Silva et al. 2017), being the result of a convergence more than 90 Ma (Martins et al. 2014). Although molecular studies suggest that the Centridini tribe is old (Renner and Schaefer 2010), Centris (Paracentris) burgdorfi belongs to a more recent lineage (Martins and Melo 2015). The preference for Krameria may have arisen to avoid competition with bees long associated with Malpighiaceae, because both Krameriaceae and Plantaginaceae are also newer groups (Renner and Schaefer 2010). More research is needed to identify the possible reasons behind this pattern. It would necessitate a search for places where the three components occur simultaneously (C. burgdorfi, Krameria, and Angelonia) to assess if there is preference for a plant species, or type of elaiophore. This situation is difficult because Krameriaceae occurs in more xeric sites (Simpson 1982), and the species of Plantaginaceae are usually linked to altitudinal sites (Martins et al. 2013). The volumetric analysis of pollen reinforced the importance of plants that have large pollen grains. Tasei and Picart (1973) affirmed that the frequencies obtained across the number of grains counted in the slides may not represent the real contribution because of the great variation in size of grains among plant species. Despite the importance of volumetric analysis that was demonstrated by some pollen studies (e.g., Buchmann and O’rourke 1991; Silveira 1991) we have to be careful when we analyze the volumetric corrections of proportions. The size of the pollen grains is not related to the amount of protein present in the pollen (see Roulston et al. 2000). Small pollen grains, such as those of Angelonia and Microlicia, may be of greater importance to the bees than simply shown by volumetric analysis. To determine the real importance of each pollen type, it is necessary to use information such as the frequency of the pollen grain in the samples, the volume, and quantity of protein of each grain. Unfortunately, we do not have information about the amount of protein of the pollen grains of plants collected in this work. 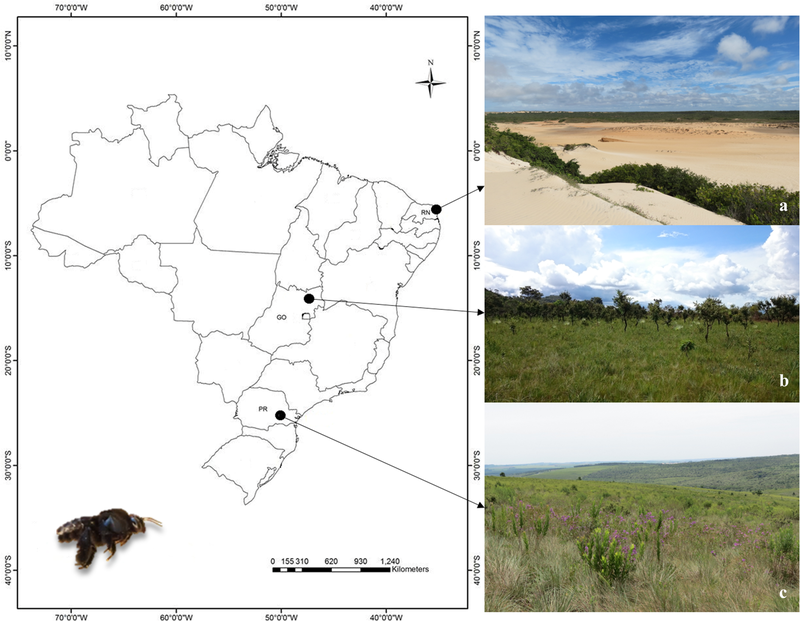 This study showed that C. burgdorfi possesses versatility in its trophic niche among distinct phytoregions in Brazil (costal dunes, Cerrado, and altitudinal fields). No plant species was shared among the three sites studied. This bee species is specialized locally in terms of the floral oil source and exhibits versatility between trichomatic and epithelial elaiophores. This versatility in trophic niche and of the type of elaiophore used allow the species to have a wide geographical distribution even where the preferred resource is not available. The authors are grateful to Paulo Roberto de Castro for help and all the support in the field work, and Ana Carolina Oliveira da Silva and Elisa Pereira Queiroz for taking all the measurements of the pollen grains. We also thank to Astrid Kleinert, Celso Feitosa Martins, Clemens Peter Schlindwein, Felipe Vivallo, Liz Nichols, Maria Cristina Gaglianone and the three anonymous reviewers for comments and suggestions on the manuscript. The research was supported by Fundação de Amparo à Pesquisa do Estado de São Paulo (FAPESP), Coordenação de Aperfeiçoamento de Pessoal de Nível Superior (CAPES) and Rede de Catálogos Polínicos online (RCPol).